The Middle East is home to some of the world’s most chaotic and violent war zones – including in Libya, Syria, Yemen and Iraq – as well as simmering conflicts in states such as Israel and Lebanon. And while these conflicts usually have multiple causes, religion and religious hostilities certainly are important factors. A new Pew Research Center study, relying on information from 2014 (the most recent year data were available), carefully catalogued hostilities in the region’s 20 countries. For the first time since we began publishing these annual reports in 2007, the study also took into account activity by the Islamic militant group known as ISIS, which declared in June 2014 that it had established a caliphate in parts of Iraq and Syria. 1As a whole, the region continued to have the highest levels of religious hostilities in the world. In 2014, the median level of religious hostilities in the Middle East and North Africa reached a level four times that of the global median. The types of social hostilities included in this measure varied from religion-related armed conflict to sectarian violence and other religion-related intimidation or abuse. 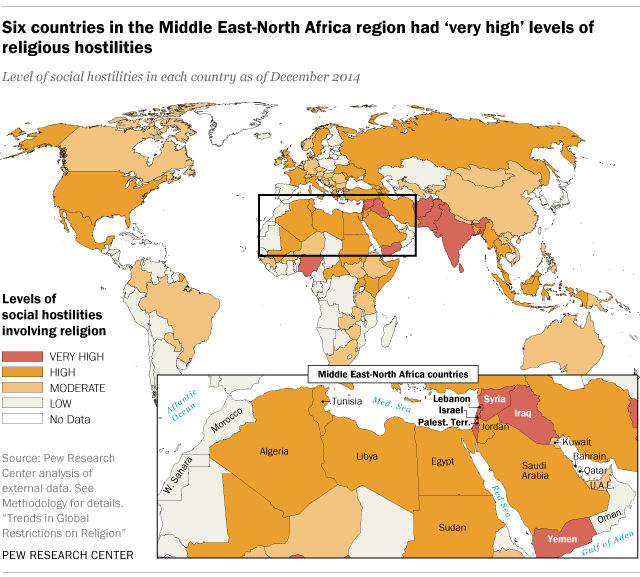 2Six countries in the Middle East-North Africa region had “very high” levels of religious hostilities during the year – including Israel, Iraq, Syria, Yemen, Lebanon and the Palestinian territories. Violent acts in Iraq by both Sunni- and Shia-dominated groups and militias, including ISIS, led to killings, kidnappings, harassment, intimidation and displacement. 3The Middle East-North Africa region had the largest share of countries experiencing religion-related terrorism in 2014, although the Asia-Pacific region had the largest increase in the share of countries that did so. Terrorist activities became more lethal in Israel in particular, where attacks resulted in over 50 casualties in 2014. Members of the Abu Ali Mustafa Brigades claimed responsibility for one of these attacks, which killed at least five people, including four rabbis, in November of that year. 4There were reports of ethnic cleansing related to religion in Iraq in 2014. Islamic State militants engaged in a “systematic campaign of ethnic cleansing … that targeted religious and ethnic minorities,” according to Amnesty International. The State Department reported instances of the group seeking to “exterminate” Shia Muslims and religious minorities by targeting Shia mosques and communities. The group massacred at least 500 Yazidi civilians in August of 2014, disposing of their bodies in mass graves. 5Harassment of Christians and Jews by both government forces and social groups increased slightly in 2014. Christians were harassed in 16 out of 20 countries in the region (up from 15 countries in 2013), and Jews were harassed in 18 countries (up from 17 the previous year). In Jordan, some converts from Islam to Christianity reported having to worship in secret for fear of social stigmas against them. Muslims also faced harassment in 17 out of 20 countries surveyed, unchanged from the previous year. 6About 800,000 more people were displaced by religion-related armed conflict in 2014 than in the previous year. Although the number of countries in the region experiencing religion-related armed conflict that led to large-scale population displacement remained the same in 2014 as the year before, more than 19 million people in the Middle East-North Africa region were displaced due to such conflicts, up from 18.2 million in 2013.